Capture is a feature of Azure Event Hubs. You can use it to automatically deliver the streaming data in your event hub to an Azure Blob storage account of your choice. This capability makes it easy to perform batch processing on real-time streaming data. This article describes how to use Event Hubs Capture with Python. For more information about Event Hubs Capture, see the overview article. This sample uses the Azure Python SDK to demonstrate the Capture feature. The sender.py program sends simulated environmental telemetry to Event Hubs in JSON format. The event hub is configured to use the Capture feature to write this data to Blob storage in batches. The capturereader.py app reads these blobs and creates an append file per device. The app then writes the data into .csv files. 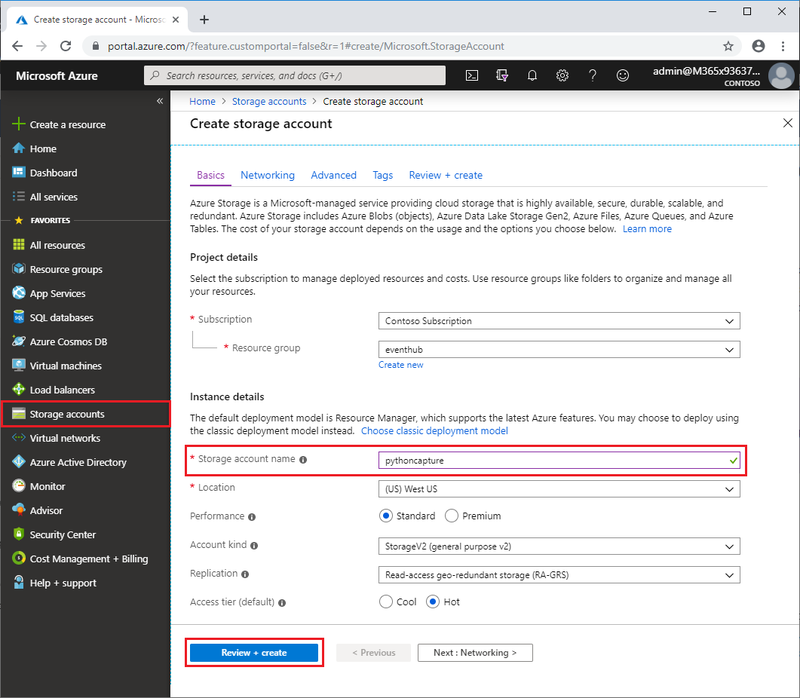 Create an Azure Blob storage account and a blob container within it, by using the Azure portal. Create an Event Hubs namespace, by using the Azure portal. Create an event hub with the Capture feature enabled, by using the Azure portal. Send data to the event hub by using a Python script. Read the files from the capture and process them by using another Python script. An active Event Hubs namespace and event hub. In the left pane of the portal, select New > Storage > Storage Account. Complete the selections in the Create storage account pane, and then select Create. After you see the Deployments Succeeded message, select the name of the new storage account and in the Essentials pane, and then select Blobs. When the Blob service pane opens, select + Container at the top. Name the container capture, and then close the Blob service pane. Select Access keys in the left pane and copy the name of the storage account and the value of key1. Save these values to Notepad or some other temporary location. Open your favorite Python editor, such as Visual Studio Code. Create a script called sender.py. This script sends 200 events to your event hub. They are simple environmental readings sent in JSON. Update the preceding code to use your namespace name, key value, and event hub name that you obtained when you created the Event Hubs namespace. Fill out the pane and select Create. Create a script called capturereader.py. This script reads the captured files and creates a file per device to write the data only for that device. Paste the appropriate values for your storage account name and key in the call to startProcessing. If you have an earlier version of either azure-storage or azure, you might need to use the --upgrade option. This command starts a new Python process to run the sender. This capture processor uses the local directory to download all the blobs from the storage account/container. It processes any that are not empty, and it writes the results as .csv files into the local directory.